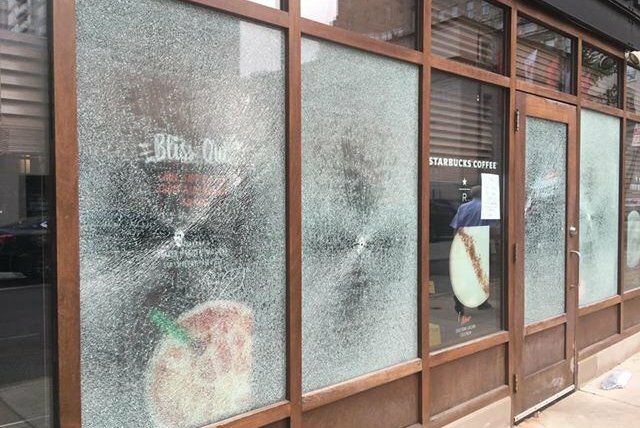 The vandalized windows of Starbucks at 18th & Spruce Streets. A Rittenhouse Starbucks, the location of controversial arrests earlier this year, was vandalized Monday. The store at 18th and Spruce streets gained national recognition in April after two black men were arrested while waiting for a business associate. Many criticized both the store and the company for what seemed to be a racially charged incident, leading to several protests and for Starbucks to issue multiple statements about sensitivity training and policy updates. The Philadelphia Police Department also instituted policy changes following the controversial arrests. Police received a report around 6 a.m. Monday that the store windows had been shattered and the store vandalized, though it's unclear when exactly the vandalism occurred. Notes were left inside the coffee shop referencing the ongoing prison strike in Philadelphia and other cities. 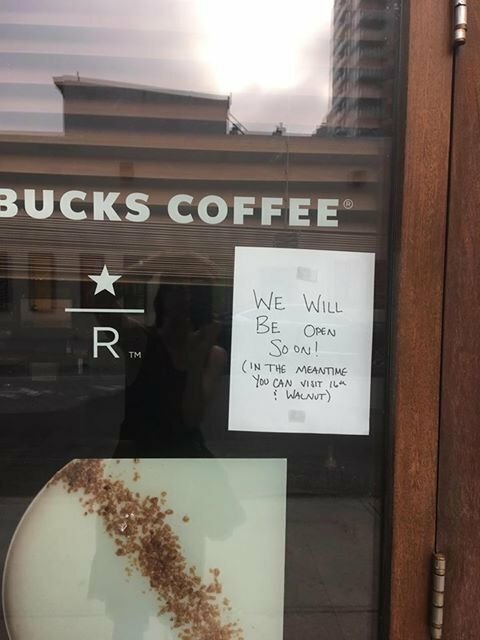 The vandalized Starbucks at 18th & Spruce Streets. The windows were later replaced and the store reopened Monday afternoon. "A couple of activists have pointed at us and a few other companies, criticizing the use of prison labor," said Reggie Borges, a spokesperson from Starbucks Global Corporate Communications. "But the irony is that we don't use any prison labor at all, or work with companies that hire prison labor." Borges noted that Starbucks had previously worked with agencies that employed prison labor, predating 2006. Once the company got wind of the agencies' labor practices, Borges said, the company updated its code of conduct to make sure similar partnerships don't occur again. Borges referenced Amani Sawari, an activist on behalf of the prison strikes who has discussed Starbucks' previous involvement in prison labor for various publications in the last several weeks. Sawari recently told Vox that companies, such as Starbucks, should be called out for its previous ties to prison labor. It's unclear whether the 18th and Spruce location was targeted for vandalism because of the April arrests. The notes left in the store only referenced the prison strike. The windows appeared to be punctured by a projectile or sharp object. They were repaired Monday and the store reopened around 11:00 a.m.